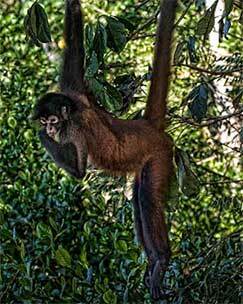 The Osa Wildlife Sanctuary is located in one of the most remote areas of the Golfo Dulce and accessible only by boat. Here injured and rescued animals and birds of all sorts are cared for and groomed for release back into the jungle (some can not return to the jungle, and the Sanctuary is now their home). Carol Patrick and her staff give excellent care to these animals, as well as provide fantastic educational tours to travelers. Most of our guests feel this is simply a must see. As the sanctuary has grown, many animals are recuperating or waiting for appropriate release dates in cages. So, if you don’t want to see animals in cages, this may not be your thing. We think Carol has done an incredible job saving many animals that would have a few years ago just been left to die. She has a couple of friendly monkeys about that for various reasons will never return to the wild, so prepare for them crawling all over you, as well as being dive-bombed by toucans, macaws, etc. Watch your glasses, pockets, etc, and it is best not to wear jewelry. Men wearing sarongs have generated a few funny stories as well. Check out more info on the Iguana Lodge Recommended Tour List here. GOOD PEOPLE DOING GOOD THINGS ~ LIONS, TIGERS, AND BEARS ~ OH MY ~ INQUISITIVE MONKEYS ~ SAVING THE DAY ~ WHO KNEW TOUCANS EAT MONKEYS AND NOT A LOT OF FRUIT LOOPS? ~ WHO KNEW SLOTHS EAT 16 TYPES OF TREES?